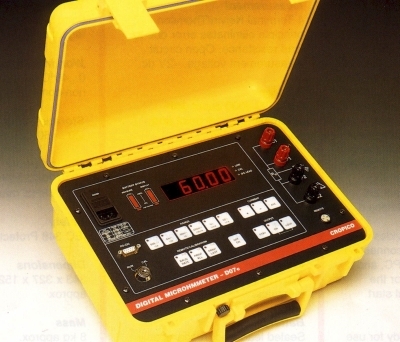 The DO7e is a very rugged yet compact and portable digital micro ohmmeter for the measurement of low resistance. Using a rechargeable sealed lead acid battery with built-in charger, the DO7e is capable of measuring with a current of 10 Amps on the lowest range. The DO7e has been designed with the latest solid state and microprocessor techniques to ensure the very best in measurement, reliability and features. Automatic range selection, forward and reverse current measurements with auto average and a remote start socket are all included as well as an energy saving power down mode.